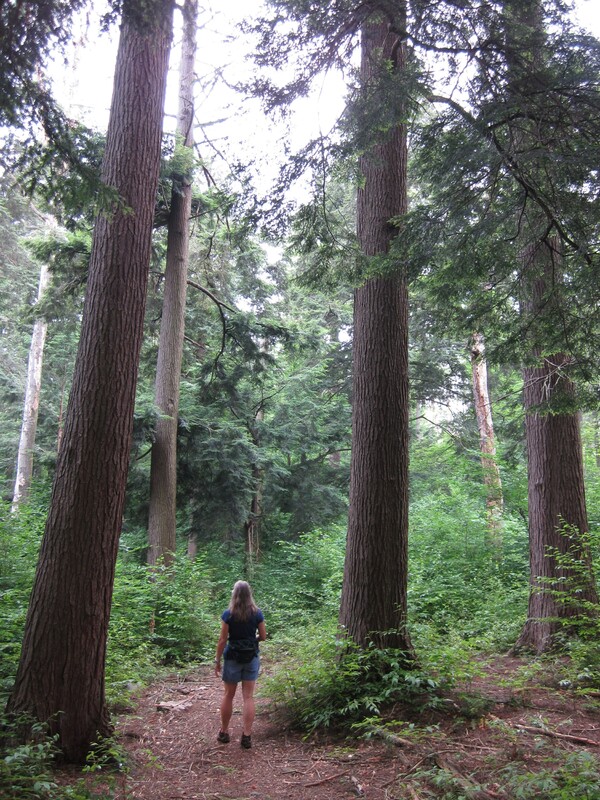 As a little girl, I remember being moved by the light in a hemlock forest. It was much different than in any other forest- diffused and velvety soft with no harsh edges but looked like honey colored the air. And the forest felt dark and cool and dense. But over the years, because of an exploding insect infestation, many of the Commonwealth’s hemlock forests are dying and disappearing, reducing them to sickly shadows of what they once were. Until I came to the Allegheny National Forest, where they are still very healthy, was I reminded of what I once had at home in the forests of eastern PA.
Wandering the wondrous groves of healthy giant hemlocks is reason enough to come to this colossal and only national forest in all of Pennsylvania but there is so much more. My son, Bryce and I came to this 500,000 acre playground to see how much fun we could discover, and how much beauty there was to be seen. This huge chunk of land in the northwest corner of our state is dominated by plateaus, rising between 1,600 & 2,300 feet. It is heavily dissected by rivers & streams that create glens, gorges and valleys. Fascinating rock formations of boulders, ledges and outcrops decorate many of the plateau’s edges and slopes. Besides the hemlock, there are black cherry, red maple, and assorted hardwoods. Over 200 miles of hiking trails lace the national forest as well as two national wild & scenic rivers- Allegheny & Clarion, slice through its wild lands. And in the heart of it all, the 12,000 acre Allegheny Reservoir with its 90 miles of shoreline …what an outdoor playground! 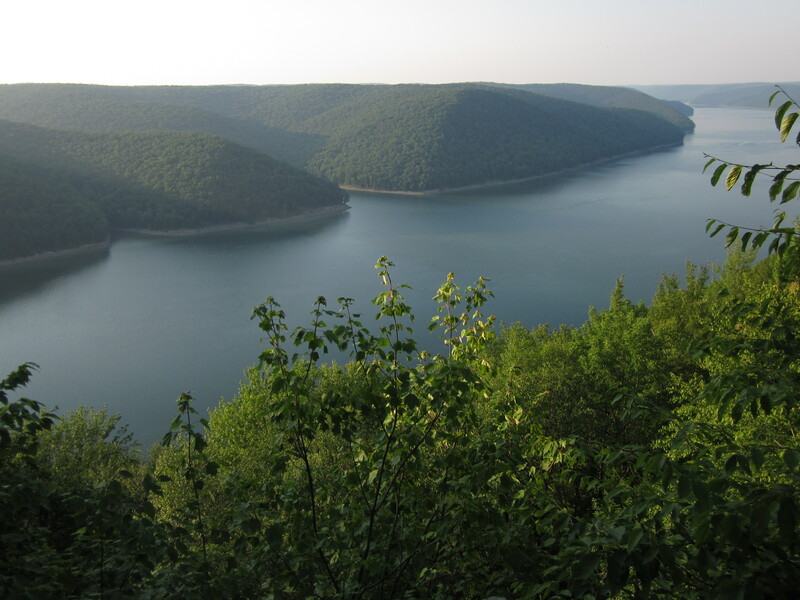 Some of the best hiking is right along the cliffside where hours can be wiled away winding through boulders, perched on a rock top overlooking the Allegheny Reservoir like Cornplanter, the Native American Indian chief who once ruled this land. Rimrock Overlook and Jakes Rocks, at 700 vertical feet above the reservoir, are two stellar short trails that can turn into an afternoon adventure. Rimrock Overlook Trail descends .2 miles through cliffs and boulders, down a rock staircase through a crevasse that narrows down to only 2 feet wide. The trail wanders along the base of the cliffs and arrives at a rock amphitheater with a deep, dark crevasse. Cold air flows out of the vent’s bottom strong enough to cause condensation on your glasses. It is created by the rocks being cooled over the winter, then in the summer, the warm air descends thru the crevasses, is cooled, then flows out the bottom. Jake’s Rocks Trail is on the opposite side of the lake, and is 1 mile trail system. It is level to rolling with fantastic views, cliffs, massive boulders and outcrops, crevasses, and rock overhangs. The true highlight of Jakes Rocks is what lies beneath them. Looking up, some of the fascinating rock formations above you are shaped like pyramids or triangles. 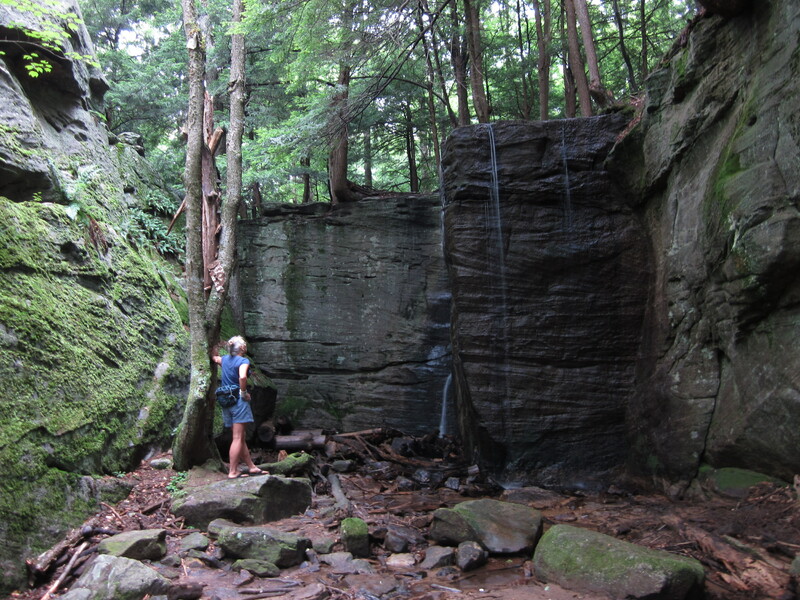 An out of the way hike is to beautiful and isolated Hector Falls- a 1 mile one way trail that follows an uneventful graded forestry road to a clearly established woods trail with only 200 feet of elevation change. The falls is a 22 foot sliver of liquid silver that courageously flings itself over a cliff of huge boulders. Although not very high, it is unique in the fact that there are few, if any other falls tumbling over sandstone and conglomerate cliffs and boulders. In low water, the stream descends through a narrow fissure with more monstrous boulders to explore. Another favorite hike is in the Tionesta National Scenic & Research Area- one of the largest remaining old growth forests in the eastern US. It takes some exploring on forest service roads to locate the small, unassuming wooden sign marking the trail’s entrance but it is well worth it. The trail is not the best in some places as it is brushy with several blow-downs. It suffered a direct blow from the 1985 tornado which destroyed many trees and left open swaths that are now filled in with tree saplings. Tunneling through the birch saplings is interesting but it is the spectacular old growth forest that we come to see, rising like columns into the canopy. This beautiful expanse of massive hemlocks, healthy old growth hemlocks, are some of the largest and finest examples of old growth in the eastern US. Unfamiliar yet exotic sounding birds echo from the canopy, giving the feeling of deep wildness. It is the trees and the forest that we come to see mostly here in Allegheny National Forest. Walking is the slowest, most absorbing way to soak in all the beauty of the north woods , but cycling is another great way to experience the forest. The Kinzua Valley Trail along the banks of the Kinzua Creek follows the path of the old Valley Railroad through forest and marshland. 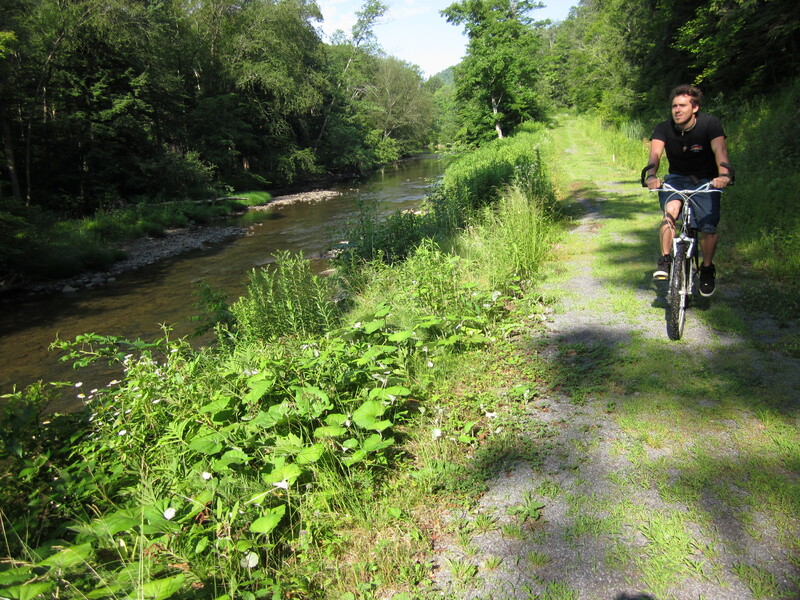 It is developed by the Kinzua Valley Trail Club and it originates at the Westline Trailhead, and extends westward. The Historic Westline Inn is a great place to base out of where you can just roll out of your comfy bed in the morning and take a sunlit ride along the sparkling creek. It sits at the end of the blacktop, right before the dirt surface begins and things begin to get wilder. Parts of the trail are grass covered and feel more like single track, with its rolling, curving bed, making it much more interesting than the average rail trail. For seven miles the trail winds alongside deep swimming holes and cool sheltering hemlocks whose braches dip low into the stream. There are frog ponds full of cattails and dead snags that look as if moose should be grazing in the shallows. When completed, the trail will extend for 22 miles all the way to the Red Bridge Recreational Area on the Allegheny Reservoir. 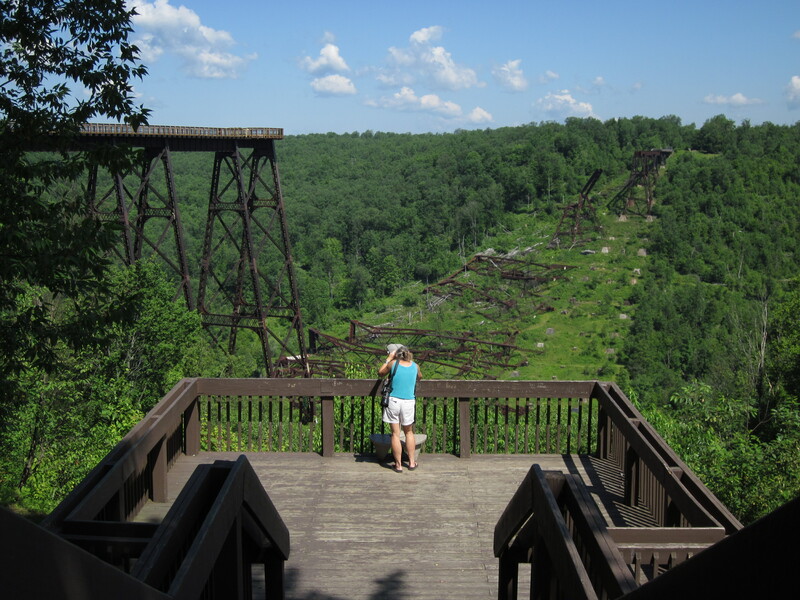 This afternoon, we visit the newly opened Kinzua Sky Walk pedestrian walkway in Kinzua Bridge State Park. Built in 1882, the train viaduct was considered one of the wonders of the modern world, for at 301 feet, it was the highest and longest in the world. But in July of 2003, a tornado toppled 11 of the 20 towers. After years of reinforcement and construction work, a 9’X12’ glass window sits in the floor of the observation deck, enabling visitors to perch on the end of the standing bridge section. The twisted bridge supports lay splayed out beneath us, the trees flattened from the “micro blast.” The force of wind is so brutally obvious here and it is dizzying to think how this monstrous bridge must have buckled and crumbled, shearing the bolts right off the legs of the towers. The Westline Inn is the best place to return to after a day in the forest and chow down on delicious crusty homemade bread with melted brie and mushrooms and broiled seafood and beef tips with rice. We dine in the company of elk, deer, and pheasants on the walls who look down at us while we eat. The wainscoted walls, rustically done up in barn wood siding, are decorated with historic photos of the bridge and gorgeous artwork from a local artist. The next day, we schedule a run down the Allegheny River with Allegheny Outfitters, based out of Warren, PA. This family-run business has an excellent store with an additional wilderness trip-planning center, which helps scout, church, and school groups, etc. plan extended trips on the river. 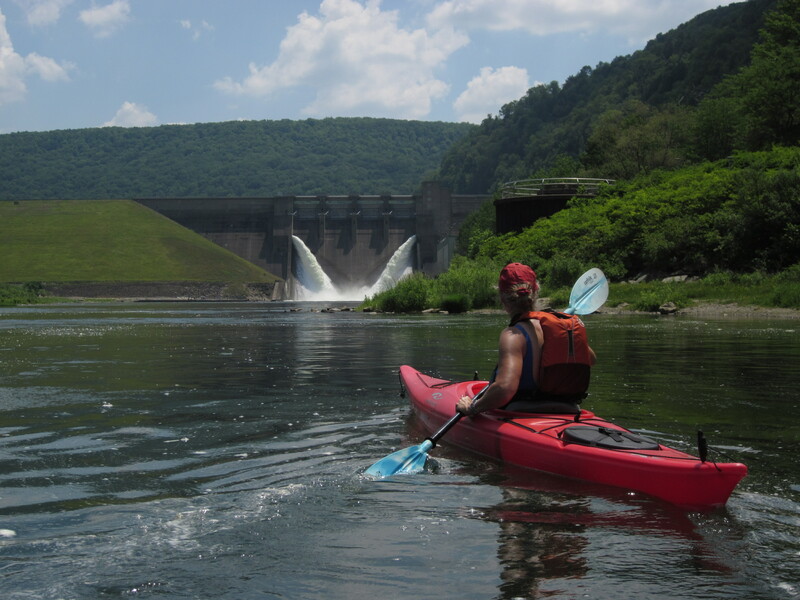 Owner Josh & Piper Lindell are very instrumental in creating a river community here in the Allegheny National Forest area, by founding an annual river clean-up day, workshops and presentations, and also publishing the Allegheny River Paddling Guide. We put in at the output at KInzua Reservoir and float down to Warren. Along the way, Josh informs us that on this Wild and Scenic designated river, there are 60 islands in a 45 mile stretch and camping is permitted on all of them! We paddle on the right side of many of the islands, transforming the wide river to an intimate stream experience. Bryce and I make a mental note to return next summer with sufficient time to explore the river in its entirety. 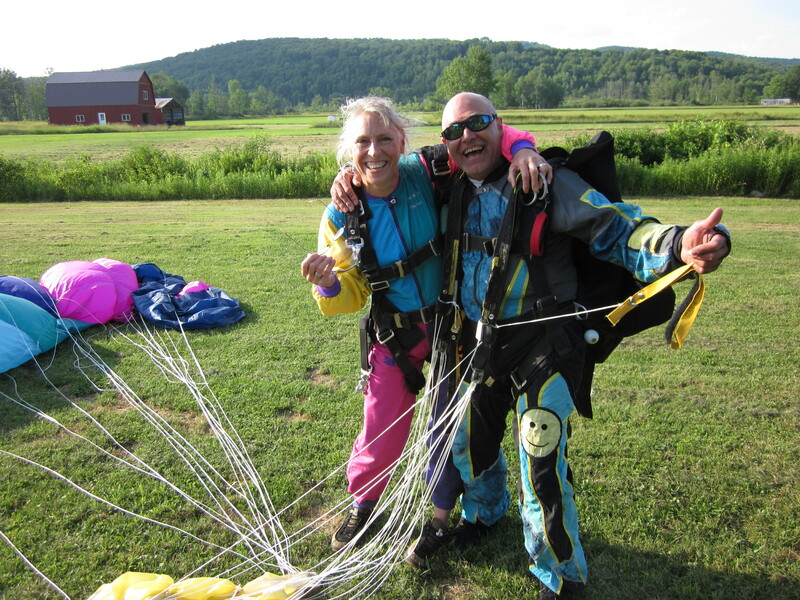 The climax of our Allegheny National Forest experience occurs at Freefall Oz, a sky diving B&B that promises to deliver an unforgettable perspective of the vast Allegheny National Forest from the air. When you pull up to Freefall Oz B&B, there is a little Cessna 182 that sits in the grass field, looking like a toy, ready for action & fun. Celine greets you like a long lost friend and get you comfortable with gourmet cheese & crackers until her hubby, Ashley “drops” in. The couple owns 12 acres, offers 4 rustic bedrooms, along with a fantastic gourmet dinner and breakfast that can only be topped by the evening entertainment…jumping out of an airplane. “The only venue like it in the world”, Ashley boasts. Ashley hails from Australia (Oz is the nickname for that country) and has jumped more than 4,000 times. He is a tandem jump master “body pilot” and his office is the big sky overhead. You land right in the front yard in a grassy air strip 3,000 feet in length after placing a pink Frisbee in the field to use it as a target. Afterwards, you stagger (from the intense adrenalin rush) into the B&B, to a gourmet Australian meal, a glass of wine, a soak in a luxurious jet filled hot tub and relaxing sauna , and a sleep in a handmade branch and log bed that woodworker Ashley crafted. After watching a waiver video, signing a stack of papers, its practice time, suit up, and into the airplane! There is not a lot of room in the body of the plane. It is stripped down to its shell- no carpeting , seats or insulation. I slide back on my knees, flatten my feet and sit on my heels. Ashley hooks me to him at my shoulders and my hips, does an equipment check, and shakes me around to see how connected we are. He is pumped, wired, juiced up with adrenalin. It is contagious, as if I needed any help to become excited. “Doors open! Left hand, right hand, thumbs under harness, squeeze, head back, eyes wide, get ready to arch!” The wind is violent. Ashley screams to be heard and I obey like a soldier. It’s easy to give up control and just trust. We do a front roll somersault, I arch my pelvis forward which drives us into the air and it is sensory overload. I search the horizon for what I came all this way to see- the Allegheny National Forest from the sky. The mountains of the Allegheny plateau roll in the distance. The river and stream cuts where we rode our bikes and hiked are clearly visible. I can’t see the canopy of old growth, but I know it is there, gracing the land with the trees’ presence. And that vast Allegheny Reservoir tucked inside the heart of the land, wide and silvery and shimmering. wow! 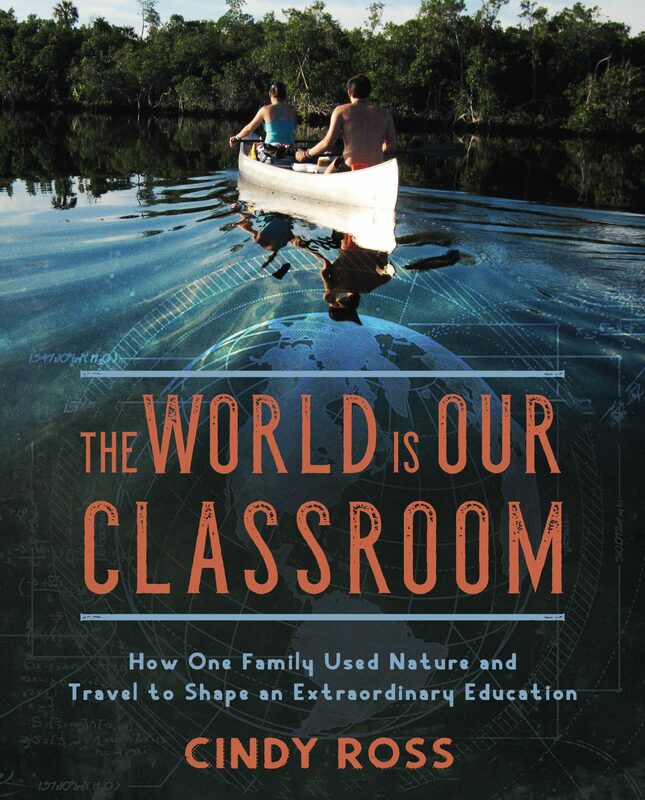 thanks for the great insight will be visiting for the first time soon, camping at one of the NF campgrounds. wonderfully written. Previous Is Change Good for an Old Goat ?